CAN THE NEW AMERICAN THEATER SAVE US? …the postmodern subject shudders, completely overwhelmed. As the true horrors of World War II, the Holocaust, anti-Semitism, fascism, and Nazi ideology sink into the psyche, indelibly branding us with the hot imagery of the war in such films as Night and Fog (1955), we are shaken, confused, and angry. In 1899, Joseph Conrad was still reminding us of “man’s inhumanity to man" with his journey into the Heart of Darkness: “The horror! The horror!" In the context of Darwin’s work, we had hoped the twentieth century might bring us evolution in the social context as well—"social Darwinism," we discussed, we wrote, we postulated. Parallel to the atrocities of World War II grew the disenfranchisement of those disabled rather than supported by capitalism. The promise of the Industrial Revolution fell short for many in the poor and lower middle classes, crushingly short. As rock music emerged, nowhere was the frustration and anger more apparent than in the lyrics of punk, metal, grunge, rap, and hip-hop. “We’re not gonna take it," Twisted Sister shouted at “the man" as Kurt Cobain muttered, “I feel stupid and contagious." Then the housing market crashed, the banks collapsed, and we found ourselves in the middle of the Great Recession. If Nietzsche and Freud stole away our faith and Wall Street stole away our money—see especially the shrinking middle class—if we are overwhlemed by the increasing speed, complication, and technological smotherment (if you’ll allow me to coin a word) of our lives, then what are we, the postmodern subjects, supposed to do in terms of our psychological and spiritual health? And…to make matters worse, we must answer this question in the context of the Korean and Vietnam Wars, feminism and its failures, the Civil Rights Movement and continuing racial injustice, the assassination of great leaders, 9-11, Middle East conflicts, and a Cold War with Russia that has never really gone away, IMHO. Answer: our artists must step up and help us solve the Rubik’s cube of what it means to be human. In Postmodernism: Or the Cultural Logic of Late Capitalism, Fredric Jameson called for an “aesthetic of cognitive mapping" to help neutralize “our social confusion." He advocated for a pedagogical culture that “seeks to endow the individual subject with some heightened sense of its place in the global system." For Jameson, the new art “will have to hold to the truth" of the “worldspace of multinational capital." These creations, he hoped, would help us “grasp our positioning" as well as “regain a capacity to act and struggle." In the past, women multicultural writers seemed to offer us the best chance for this new art. After Kate Chopin wrote Edna Pontellier swimming endlessly out into the ocean and Edith Wharton could do no more for Lily Bart than have her drink a bottle of chloral and go to eternal sleep, Octavia Butler invented a new kind of religion, Earthseed, and her protagonist Lauren led her people from a dystopia to a more optimistic future; by the end of So Far From God, Ana Castillo wrote Sofi into founding a supportive community M.O.M.A.S. (Mothers of Daughters and Saints); and in Alice Walker’s The Color Purple, Celie starts a pants company, becomes friends with Mister, and holds a family party, uniting all on Independence Day. Lights rise on Sigourney (Caitlyn Gallogly), a medical student who has lost a grant and needs a job. 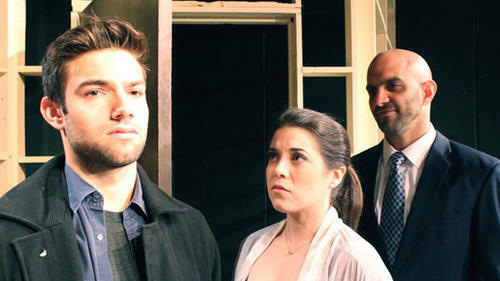 She stands in a park, persuading her reluctant boyfriend Marv (Greg Nussen) to fully commit to their relationship. Marv prefers to study and states he’s not ready for them to move in together. Recommended by her research professor and mentor (Ashlee LaPine), Sigourney gets a job as a research subject with Dr. Robert Eden (Eddie Alfano) who manipulates her in an unethical psychological experiment. Committed to nothing but her bed after she discovers the emotional trickery, Sigourney represents all of us in the chaotic postmodern world, completely overwhelmed by multinational capital, the concomitant lack of ethical drivers, and the chaos that ensues from terrorism, other forms of war, the aforementioned inhumanity, man to man. The overall bummer that can be contemporary life (although I should explain that the play does not address such subjects as war, terrorism, or postmodernism directly). Parallel to the exterior plotline runs Sigourney’s interior character arc. Dr. Eden gives her a series of boxes, she’s to open each one then record her thoughts in response to the object inside. One appears as a black evening glove, like she might wear to a ball, but it has a drop of blood on it, a decorative button is missing, and it’s black—in other words, we’re not in Disney’s original Cinderella anymore. A second item emerges as a golden pump, reminiscent of the glass slipper, but when Sigourney tries it on, she falls and twists her ankle. Princes and fairy tales are not the answer, Selbo argues. A point of interest in Sigourney’s conversations with Dr. Eden recurs…a princess cut diamond necklace her estranged father had given her. After the doctor’s betrayal, her neck lies bare. We recognize that she has let her father go, but we come to realize that the absence of the necklace represents a second beat in her character arc as well: Sigourney has sold the necklace to pay a fellow student to help her in a plot to turn the tables on her boss. In the final scene, we are back in the park with Sigourney and Marv. He finally asks her to move in. She says no. Sigourney no longer wants or needs to be daddy’s little princess—or anyone’s princess for that matter. The glove, the shoe, the diamond—all are now gone. She has learned, changed, grown. Selbo leaves open the possibility for future romance between these two—the play literally ends mid-sentence, but Sigourney stand strong and defiant now—no longer begging boyfriends or bosses for opportunities. Sigourney may begin weak when we meet her, but we are inspired in our own lives as we watch her teach Dr. Eden a little something about ethics and emerge as the stronger in her relationship with Marv. As such, the play offers a clarifying cognitive map for women struggling to find their agency, autonomy, authority, self-reliance, and—most important—voice in the early twenty-first century. Perhaps the new American theater can save us, one and all.